Issue #71 of Australian Quilters Companion is now available and it is jammed packed with beautiful projects. 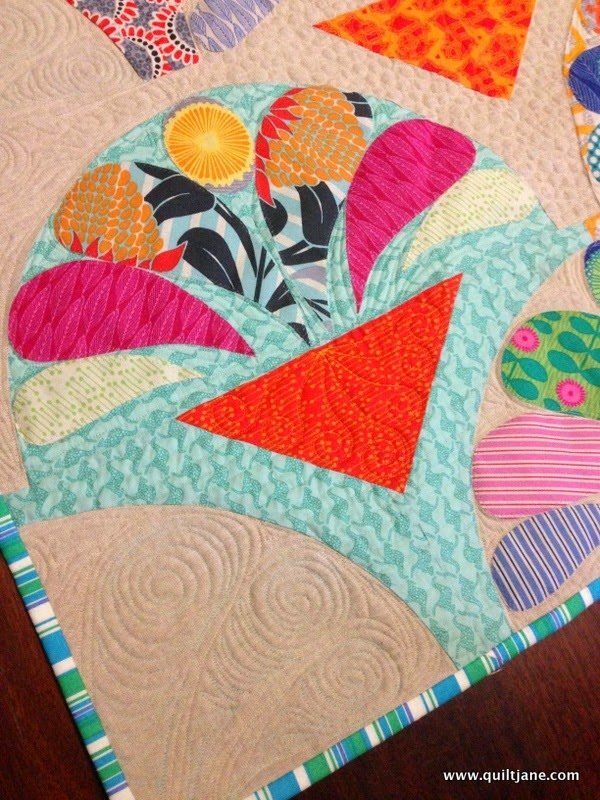 My cultured Clams, made with Emma Jean Jansen’s Terra Australis I and II on a natural linen background, uses appliqué meets drunkard path to create a bright and fun quilt. Finished with free motion machine quilting using Aurifil 50wt cotton threads the lap quilt would make brighten up any lounge or wall. This is a FABULOUS quilt! 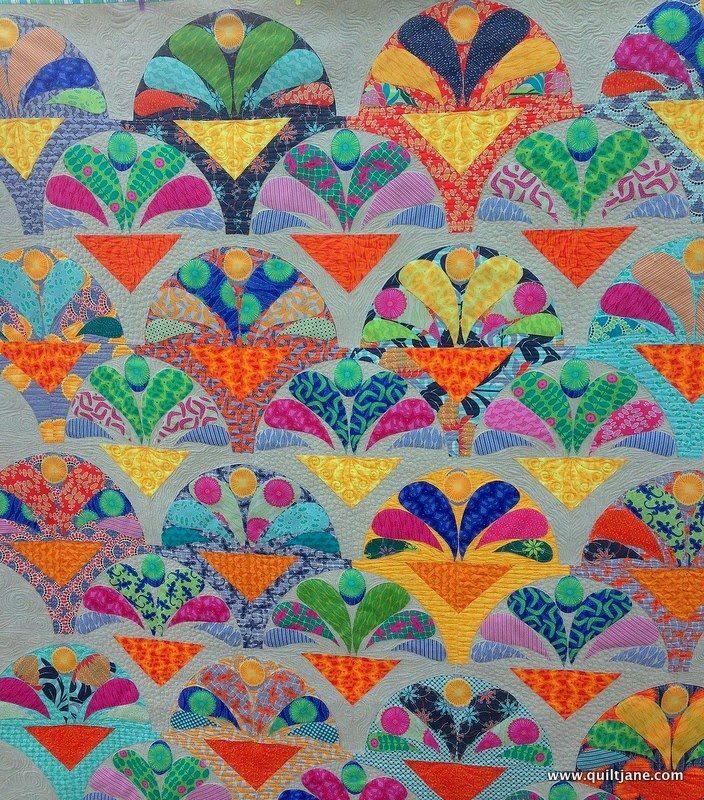 The pattern, the colors….it's wonderful! Jane, Jane, Jane, this is just stunning! Such a gorgeous art-deco make modern feel to it. 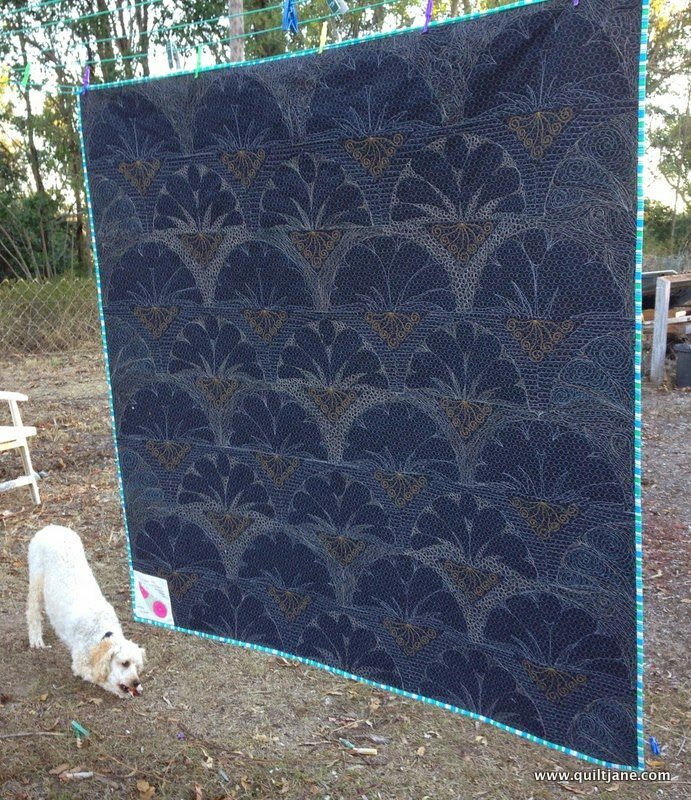 I love the front, but the back – my goodness, that quilting!! I would have to hang this is in a rotating case so I could see both sides. You've really pushed the bar up another notch, my dear!! Jane…I just love this! I'm going to have to find this magazine!!! Wow Jane – the back is as stunning as the front! wow Jane, this is amazing! What a fun, great, gorgeous quilt! And the quilting is WOW. You always change things up and make the most different but gorgeous quilts. This is stunning. Gorgeous! Love the happy colors! wow! I've considered making a clamshell quilt, but this takes it up 10 levels. congrats on a lovely quilt! Uh, Gor-GEOUS!! This is just, WOW! this is gorgeous. You did a fantastic job. Wow that is beautiful and the quilting perfect! WOW! That's amazing front AND back. I'm so jealous. Wow. It truly is fabulous. WoW! Thank you for showing us the backside too! Amazing. Wonderful job! !